This is the pretty normal hockey story for many of us. Most of us don't make it to a high level. Many of us give up the game in our youth, probably a couple years later than we should have. There are other things we begin taking an interest in - video games, girls, schooling, girls, music, girls, etc. We lose the love of playing, but feel the pressure to keep chasing the national dream because that is what we are supposed to do. Especially when that dream is spoon fed to us by a parent. That is exactly what Tyler faces in Making Select. He achieves every kid's goal of making the select team. But he soon realizes the pressure at this level is more than he bargained for. He would rather return to the fun of house league, but his hockey crazy mom applies as much pressure for him to stay as any coach or teammate. 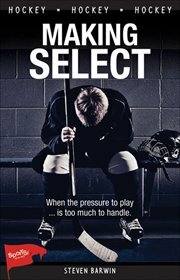 Hockey burn-out is something many kids feel. As this book is aimed at young readers, specifically young boys who may be reluctant readers, it is a book young boys should read. It is okay to let the game go, or at least stay in house league and play for fun. Life is too short to be doing something you do not really want to be doing anyways. The quicker kids learn that lesson the better off they are. Author Steve Barwin has an important offering here in Making Select. He understands the target juvenile audience expertly. After all, he is a middle school teacher in Ontario and has written several Sports Stories novels including Fadeaway, Rock Dogs, SK8ER, and Icebreaker, which was chosen as a Canadian Children's Book Centre Best Books for Kids and Teens selection. All in all, a solid new title from Barwin and Lormier publishing.